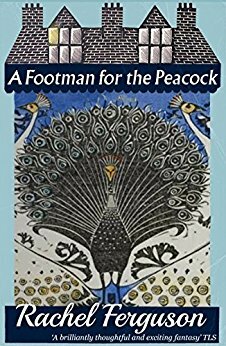 A Footman for the Peacock is a strange little novel. The novel was controversial when it was first published during World War II, because it depicts an upper-class family that tries to avoid its civic duty during the war. But that activity seems almost incidental to the rest of the plot. What is the plot? The narration flits around in time but centers on the Roundelay family. Their current configuration consists of Sir Edmund and Lady Evelyn and their household of two daughters, three elderly aunts, and three or four servants, including the retired and senile Nursie. When we finally seem to be settling somewhere, on the new Lady Evelyn’s growing acquaintance with the village and regional customs, we stay only long enough for her to hear an old running song, which Evelyn in her innocence takes to be about hunting. then we skip over to her daughter, Angela. Angela seems to have a sensitivity to an upper-floor servant’s bedroom where the words “Heryn I dye, Thomas Picocke, 1792” are etched on a window pane. She makes an odd connection between this room and an unfriendly peacock in the grounds of the estate, which seems to be signalling Nazi bombers to destroy the house. I guess I found this novel, which has a supernatural element, peculiar enough to be amusing, but it certainly has an unusual premise. I had more of a problem with the scattered narrative style, which took a long time to get somewhere. Ultimately, the novel becomes a story of class abuse and cruelty in the 18th century. Hmm – sounds a bit strange, but oddly intriguing! And isn’t the cover great? I do like to see older books being given covers that look modern rather than being stuck in the past. Yes, it’s gorgeous, isn’t it? In what century does the novel unfold? It’s World War II, so 20th. The plot involves a servant in the 18th century, but doesn’t actually take place then. This sounds like a peculiar yet interesting read. I’ve really enjoyed all the Furrowed Middlebrow books I’ve read so far, and might have to give A Footman for the Peacock a try too. Lovely review!